This project utilized a feminist appreciative approach to Action Research to facilitate a conversation about gender and leadership within the British Columbia Wildfire Service (BCWS). The research question was, “How might understanding gender and leadership support excellence in the BCWS?” This study found that amongst diverse perspectives on gender and leadership, ultimately gender discrimination is occurring within wildland fire culture in the BCWS. Participants suggested action steps based on supporting organizational and leadership learning through non-judgemental, safe spaces for dialogue. This provided an opportunity for the BCWS to transform the challenges associated with gender discrimination in the wildland fire profession through organizational learning. "Land cover maps are a powerful tool that can aid in better landscape-scale natural resource management decisions. Potential application of land cover products in the context of pre- and post-fire planning and reporting. This 40-minute presentation will be followed by 20 minutes of Q&A and group discussion, with participant input on the best land cover product applications and interfaces for different management uses. 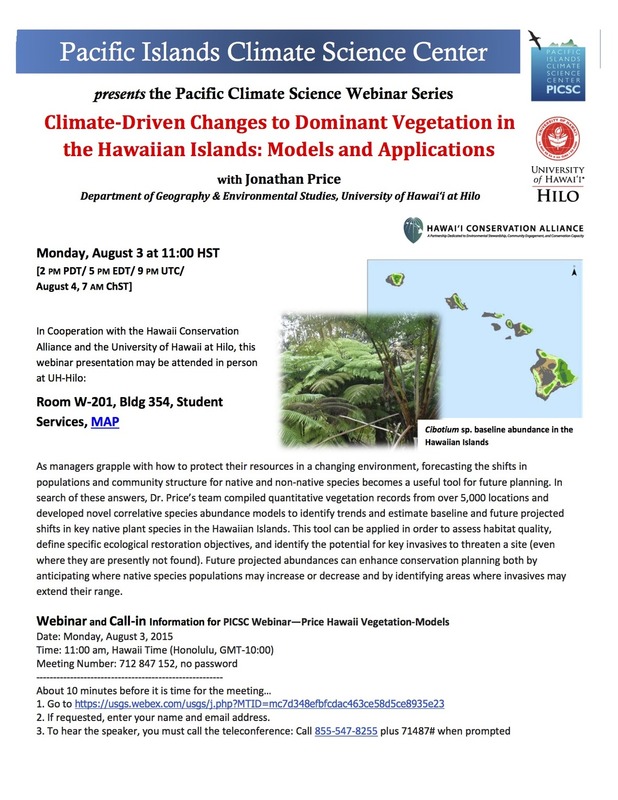 Intended Audience - Natural resource managers, fire managers, and GIS users in Hawaii and US-affiliated Pacific Islands who could benefit from understanding, on a landscape-scale, map data on vegetation, land cover, and land cover change. Matthew Lucas is a Master of Science graduate of the Natural Resource and Environmental Management Dept at University of Hawaii at Manoa. His specialty is GIS, remote sensing, and landscape ecology with a particular focus on developing spatial products which aid in conservation and natural resource management decisions. "Drought is a prominent feature of the climate of Hawai‘i with severe impacts in multiple sectors. Over the last century, Hawai‘i has experienced downward trends in rainfall and stream baseflow, an upward trend in the number of consecutive dry days and wildfire incidents, and regional projections show that unusually severe dry seasons will become increasingly common on the leeward sides of all Hawaiian Islands. This talk presents the state of the science on drought in Hawai‘i, and analyzes a new gridded drought index product (SPI, Standardized Precipitation Index) that was developed for the main Hawaiian Islands from 1920 to 2012. This dataset is used to determine the relationships between drought and large-scale modes of natural climate variability (including the El Niño-Southern Oscillation), analyze the spatial extent, frequency, severity, and duration of historical drought events, and examine trends through time. This spatially explicit analysis provides the historical context needed to understand future projections, and contributes to more effective policy and management of natural, cultural, hydrological and agricultural resources." Join the "Fire & Ohia" webinar with our friends from PFX on September 6th (11a-12p HAST). Discover the three distinct areas surrounding structures within a home ignition zone and identify how mitigation and maintenance in each section plays a distinct role in improving survivability during a wildfire. This in-depth look into the three unique distances encompassing a home will have you viewing the landscape through a different set of eyes. This pre-fire planning webinar will run through the basics of wildfire risk assessments, steps towards developing your own Pre-Fire Plan, and any other ideas and questions you may have regarding this topic. Great opportunity for land managers, planners, fire personnel, and the curious public to find out what the projected native and non-native species populations and their ranges will look like in the future. This could help us understand what fire behavior could look like in different locations. "As managers grapple with how to protect their resources in a changing environment, forecasting the shifts in populations and community structure for native and non-native species becomes a useful tool for future planning."